Probably I have already told you of my passion for trying new recipes and getting to know a country’s culinary traditions. I find that since we have been living in Ireland I have been experimenting a lot with salads. With this I don’t mean that salads are part of Irish tradition but I believe that here, where the number of traditional Irish recipes is limited (at least in comparison to countries like Italy), people tend to explore other cultures and ingredients from abroad. That’s probably why, when invited at dinner by friends, I often get to experience new combinations in salads! Another reason why I’m experimenting with salads is that our new diet brought me to try many new ingredients, and many of these fit in salads. While in the Italian tradition we have many types of summer salads, winter ones are usually kept simple as most of the work in the kitchen is dedicated to prepare main dishes. These new salads that I am embracing could be – sometimes – time-consuming and involve cooking as well, but they definitely are worth it. 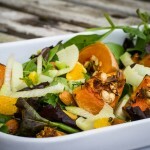 I got inspired for this Butternut Squash, Oranges and Fennel Salad by GreenKitchen’s roasted pumpkin & peach salad recipe, but I replaced the peaches with oranges, because Butternut squash and fennel are not in season when peaches are in this hemisphere! Now that I think of it: oranges in a salad are something that is known in Sicily: my dad, for example, dresses them with anchovies! Bizarre but nice combination! To prepare the Butternut Squash, Oranges and Fennel Salad you need to peel the orange in a particular way called “a vivo” in Italian. I couldn’t find an adequate translation. You practically have to peel the orange as if it were an apple, making sure your knife cuts to the flesh of the fruit. When you have finished to peel you will have a bare orange with no white skin on. 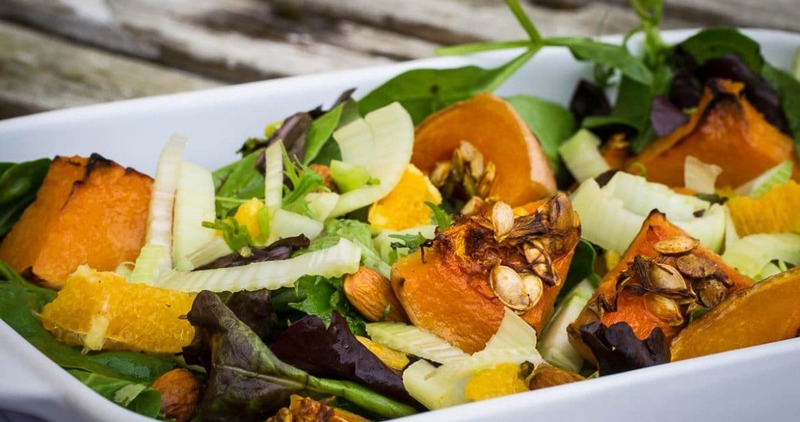 I have been doing the butternut squash, oranges and fennel salad many times now and I love how it enriches the table with autumn orange colours. I also love the almost burnt butternut squash that doesn’t need to be peeled and its roasted seeds still attached. Wash your butternut squash, dry it and cut it in half. Without peeling it and without removing the seeds cut it in half again and then in rectangles. Place them on a baking tray with the skin facing down. Drizzle them with olive oil and salt. Roast them in a hot oven at 220 C degree for 45 minutes until they are soft and they start to burn at the top. Place the almonds in a baking tray evenly distributed and toast them for 10 minutes. Peel the oranges as if it they were apples making sure your knife cut to the flesh of the fruit. When you have finished to peel you will have two bare oranges with no white skin on! Cut the oranges in segments or pieces as you like. Wash and dry you leaves. Place your ingredients in a serving bowl. Dress them with some black pepper, olive oil, salt and the juice of half a lemon. Toss everything with two salad spoons and enjoy!